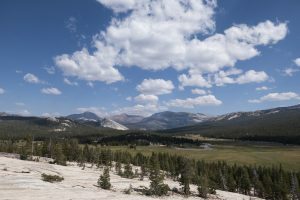 This short hike at the west end of Tuolumne Meadows gives you a great vantage of the meadows and takes you to a collection of rapids on the Tuolumne River. From the Pothole Dome shuttle stop, follow the obvious trail that skirts the meadow (avoid walking through the sensitive vegetation of the meadow). You’ll get nice views of the meadow as you head towards the base of the dome. While there are many places to start climbing, wait until the trail heads into the trees where the long ramp to the top becomes visible. This leads to wonderful panoramic views of the entire Tuolumne Meadows area and out to the fantastic summits of the High Sierra. Return to the base of the dome and continue on the trail as it bounces between forest and meadow until it reaches the river. 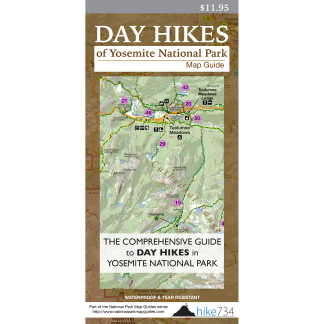 Trailhead: The trailhead is located at the west end of the small parking area and shuttle stop on the north side of the road at the far east end of Tuolumne meadows.